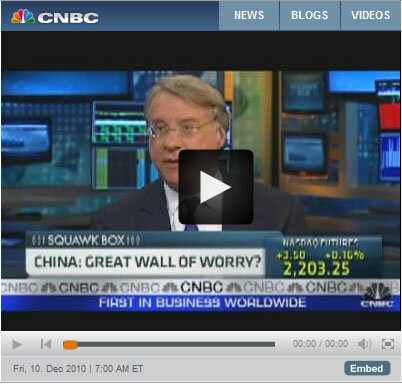 Here’s a recent interview with Jim Chanos on the critical state of the Chinese economic picture. Chanos typically makes his money short-selling overpriced markets and he’s “all over” China like stink on a pig; has been for well over a year. Should Chanos’ vision play out, global implications would include a massive spreading of deflation throughout commodities markets – since most are currently being supported mainly by Chinese demand and China-centric global speculation. Therefore, major commodities-based economies such as Canada, Australia, New Zealand, most South American countries, and many others, would take a direct economic hit as well. Obviously, a contracting/declining global economy hits energy demand, so OPEC would soon find itself to be awash in oil (again) and prices would quickly begin to adjust. Wildcard! A new “global cooling” trend – should it continue – would add significant support to energy markets while dramatically increasing food prices due to hoarding and shortages. As indicated by Chanos, many European countries – already in dire financial straits – would also be hit hard as they are heavy “net” exporters to China. In light of deepening “austerity”, local implications would be severe and Europe would become a social tinderbox. It seems unlikely to me that the Euro, and even the “EU” itself, would survive such a scenario. U.S. financial interests would be hit indirectly (we’re not major exporters to China) by significant exposure to private and sovereign defaults emanating primarily from Europe. It’s hard to guess if there would be any willing “deep-pockets” buyers for new U.S. debt (other than the Fed) in this “SHTF” marketplace. Could this imply QE3…QE27…QE243? With many nations becoming unwilling or fiscally incapable of cooperating in global “bailout” schemes, a powerful new wave of protectionist/separatist/isolationist pressures would likely be unleashed – presenting increasing resistance to further globalization efforts as nations and entire regions begin to suffer acute internal stresses and national leaders fight viciously for political control and survival. In the extreme, capital flows would be restricted if not entirely stopped in some (or many) countries and new international hostilities would likely appear. Consider this scenario an “equal and opposite reaction” to many decades of globalist pressure and prima facie cooperation. Question whether or not “globalization” is a natural evolutionary development and, if not, is it sustainable without devastating cost to both man and nature. Overall, this scenario – kicked-off by a major slow-down in China – plays well with the long-wave deflationary theories I continue to support – as a massive overhang of globally-digitized “bubble-credit” continues to forcefully unwind in a somewhat unpredictable and virtually uncontrollable manner. As I read it, we’re still relatively “early” in this grand deflationary cycle. The entire “game” has been delayed by the deceptive and massively harmful “inflationary meddling” of a global band of politicos and central banks acting in concert in pitifully vain attempts to circumvent laws of nature and physics; what goes up must come down. In my book, Rule #1 is “In the end, gravity wins.” All other rules follow. As most readers know, the vested financial interests have carried this “ploy” off by exponentially increasing sovereign (national) debts that have served PRIMARILY to bail themselves and their cronies (private interests) out of losing speculative gambles (which created the whole mess in the first place) with real “cash money” taken directly from “taxpayers” via the creation of massive new PERMANENT sovereign debts. These reckless and grossly irresponsible acts will serve to multiply the eventual damage to “real” people by the future – albeit delayed – collapse of large sectors of both global and local economies. In this continuation of an age-old story; a few play, while most just pay. We’ll continue to pay…and pay…until we put a stop to it. Meanwhile, NO job is safe, NO pension is safe, NO investment is safe. Assuming a deflationary environment exists, CASH continues to be KING until the storm passes. Remember, depressions happen one household at a time. Why? Because, for an endless variety of reasons, depressions FORCE OTHER PEOPLE to hold tight to their money and this quickly travels through economies as the “multiplier effect” works to rapidly undermine households and vital small businesses through chain-reaction. That’s why it’s called a “deflationary cycle” and, in order to be stopped, a cycle must generally be allowed to fully play itself out. The sooner we learn to stand back and allow this to happen (See: Iceland Exits Recession), the less damage we’ll all sustain in our lives and the better off we’ll all be in the end. The unfortunate fact is, there is simply no way to avoid the pain. Scary as it seems, we MUST step up and face the lashings. Just be sure to remember who brought us here. In my consulting practice, I work with individuals, business owners, and professionals. I assist business owners and professionals in several critical areas ranging from business start-up, marketing, operational challenges, employee retention, and strategic planning to personal asset protection, financial, and retirement income planning. Often, these areas relate and need to be integrated to work most effectively. I also assist business owners in developing exit-strategies that enable them to maximize the value of their business interests and preserve their lifestyle in retirement. For individuals, I primarily focus on tax reduction, financial, and retirement income planning. Wow what a genius this Jim is. He will be the richest man on planet earth and everyone else is the poorest. But 2011 will just be like 2010 where his predictions never come thru. Then he will be the richest in 2012.